If so, it would be the first "interstellar object" to be observed and confirmed by astronomers. 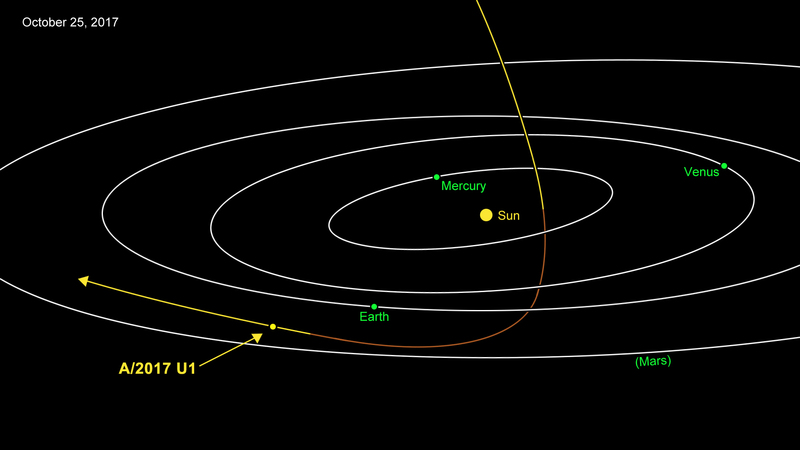 Pulled by the Sun's gravity, the object made a hairpin turn under our solar system, passing under Earth's orbit on Oct. 14 at a distance of about 15 million miles (24 million kilometers) -- about 60 times the distance to the Moon. It has now shot back up above the plane of the planets and, travelling at 27 miles per second (44 kilometers per second) with respect to the Sun, the object is speeding toward the constellation Pegasus. Google's Latest Self-Learning AI Is Like an "Alien Civilisation Inventing Its Own Mathematics"
The AI that vanquished humanity at perhaps the most complex traditional game on Earth was inconceivably smart. But not smart enough to survive its own replacement by an even more awesome, alien intelligence. Google's DeepMind researchers have just announced the next evolution of their seemingly indomitable artificial intelligence – AlphaGo Zero. AlphaGo Zero is entirely self-taught, learning by 100 percent independent experimentation. In 100 games against Zero, a previous AlphaGo incarnation – which cleaned the floor with us in 2016 – didn't pick up a single win. Not one. "It's like an alien civilisation inventing its own mathematics," computer scientist Nick Hynes MIT told Gizmodo. "What we're seeing here is a model free from human bias and presuppositions. It can learn whatever it determines is optimal, which may indeed be more nuanced that our own conceptions of the same." Allow us our moment of silenced awe as we witness the birth of this astonishingly powerful synthetic way of thinking. It might not do what humans can do, but it can do so many things we can't, too. According to DeepMind, those capabilities will one day soon help Zero - or its inevitable, evolving heirs - figure out things like how biological mechanisms operate, how energy consumption can be reduced, or how new kinds of materials fit together. Interacting with other humans is hard enough for most of us. How on Earth can we get along with awkward, unfeeling robots? By being prepared, that’s how. Welcome to the world of human-robot interaction, in which people have to adapt to the machines as much as the machines have to adapt to us. Robots need to figure out ways to engender trust. And that brings us to an ethical quandary: What happens when robots begin to take advantage of that trust? Plenty of robots, especially those meant for the home, will be mighty charming. In the near term, they'll act more like pets, following us around and keeping us company. In the long term, they'll get better and better at manipulating our world, doing things like lifting the elderly out of bed. That may seem affectionate, but a robot can’t genuinely return your affection; its love is a calculation, not an emotion. It’s only a matter of time before a robotmaker figures out how to exploit that nonreciprocal relationship.This will be particularly problematic for children and the elderly, who may not understand the nature of their robotic bond. The gigantic, mysterious hole "is quite remarkable," atmospheric physicist Kent Moore, a professor at the University of Toronto's Mississauga campus, told Motherboard over the phone. What's strange here, though, is that this polynia is "deep in the ice pack." A polynia was observed in the same location, in Antarctica's Weddell Sea, in the 1970s. Back then, scientists' observation tools weren't nearly as good, so that hole remained largely unstudied. Then it went away for four decades, until last year, when it reopened for a few weeks. Now it's back again. Scientists can say with certainty that the polynia will have a wider impact on the oceans. "Once the sea ice melts back, you have this huge temperature contrast between the ocean and the atmosphere," Moore explained. "It can start driving convection." Denser, colder water sinks to the bottom of the ocean, while warmer water comes to the surface, "which can keep the polynia open once it starts," he said.